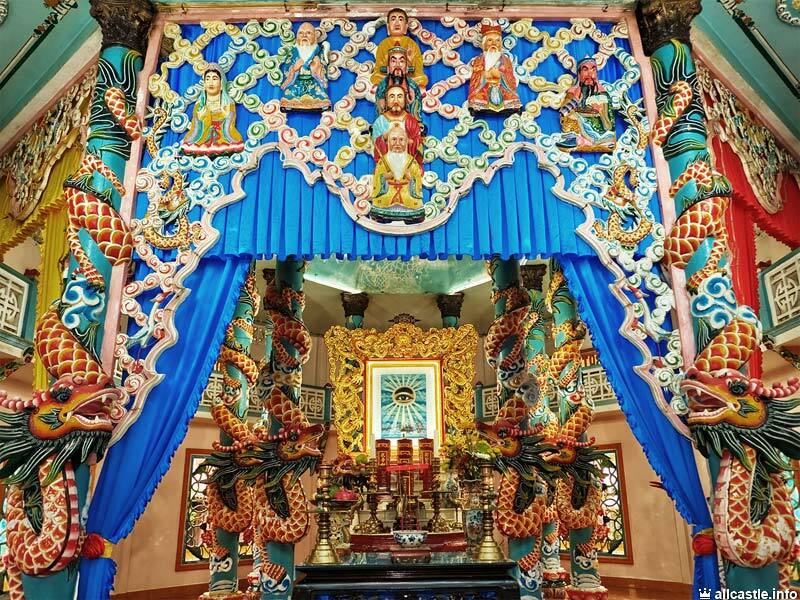 Cao Dai Temple is one of the contribution of Vietnam to the world has been the religion Caodaista, religion that takes concepts from Buddhism, Christianitu, Hinduism, etc. 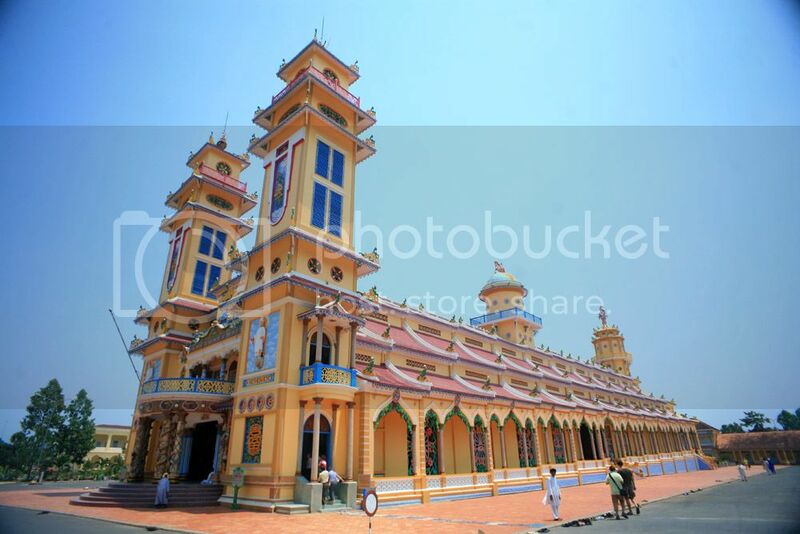 Cao Dai temple in Tay Ninh, called Toa Thanh or Divine Temple, is the largest of all the churches Caodistas. It started in 1927 and opened in 1955 after many years of construction due to delays caused by financial and political problems. Cao Dai Temple is a curious and unique architecture building, mixture of Asian and European architectures, where what most noteworthy of its exterior are its vivid colors and shapes of roofs. It occupies an area of 100 hectares. The whole complex is surrounded by a fence that protects the complex, with 12 gates. The largest of all door is normally closed and only open to make way for leaders and public personalities. 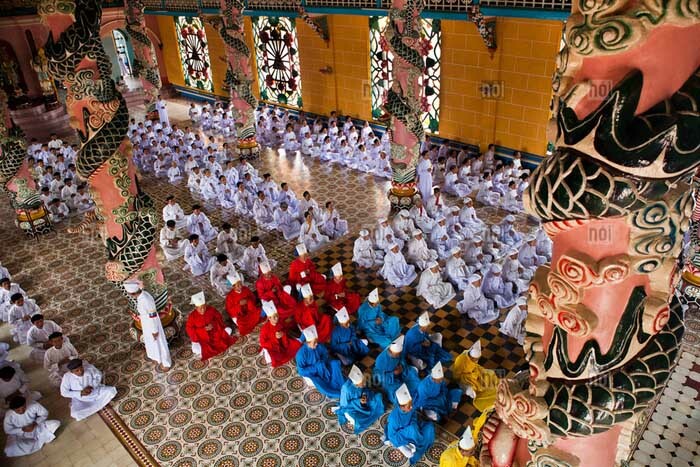 The dimension of the Cao Dai Temple is 140 meters long, 40 meters wide and 36 meters high. Runner which can be seen in the exterior is supported by 112 circular pillars. It consists of 4 towers which are named differently as Tam Đại, Hiệp Thiên Đài, Cửu Trùng Đài and Bát Quái Đài. Watching Caodiasts pray is one of the major highlights when visiting the temple as they dress in long flowing robes of white for lay followers, yellow, blue or red for priests whilst bishops have the Divine Eye embroidered on their headpieces. During worship men are seated on the right and women on the left with all devotees seated in orderly rows. The building is a combination of Neo-Gothic, Baroque and Oriental design and is very ornately decorated including dragon wrapped pillars, seven-headed cobras and ceilings of sky blue. 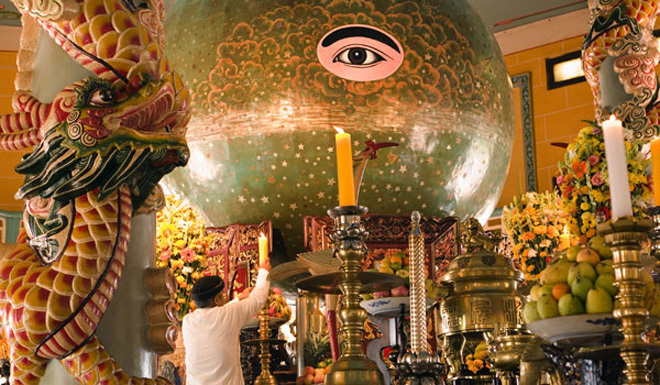 The temple is best visited by booking a tour due to its location close to the Cambodian border, 100km northwest of Ho Chi Minh City in the Long Than village close to Tay Nihn. Worship takes place every six hours and starts at midnight with chanting at 06:00 and 18:00 daily.